18 Purchases in last 24 hours! Get the lace-lavished styling of a bralette with the shaping and support you expect from Bali bras. Beautiful transparent lace completely covers this bra, with lace trim extended above and below the cups. 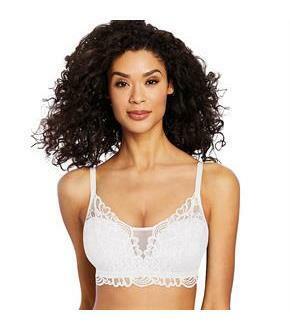 Under the lace, wirefree cups are lightly lined for shaping and support. No-slip fully adjustable straps. ComfortFlex Fit bra with sizing system that fits S-2XL and everything inbetween. Back converts to criss cross with j-hook. Pretty lace back band.